Join Garage Academy x Work In Progress for our KICK OFF 2019 WITH CONFIDENCE series throughout January 2019! Wednesday 16 January @ Garage Central -- "Pitch Your Personal Brand With Confidence"
Wednesday 23 January @ Garage Wan Chai -- "Confident Resume Writing"
Wednesday 30 January @ Garage Central -- "Confident Public Speaking"
Join Work In Progress Ambassador and Im Ovar it founder Natalie Hallows for an interactive workshop to help you start thinking about your skills more confidently and getting them down on paper! Your resume is one of the most important marketing tools to showcase your career, and it is the first step in getting hired. 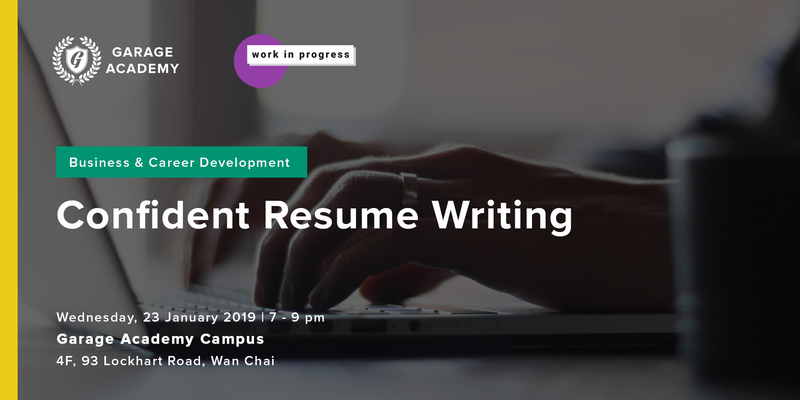 Please bring your resume for review, either as a paper copy or a version on a device (i.e. iPad, laptop). Work in Progress is a hub where you can seek advice and connect with peers, coaches or mentors. Whether you want to change career, overcome a roadblock in your life or get practical advice on how to start something new, WIP can help you to build confidence in the path you've chosen. Natalie Hallows is a recruitment consultant for the tech and creative industries and has revamped hundreds of resumes to help candidates present themselves more confidently. She is the founder of Im Ovar it, an organisation helping women present themselves more confidently for the career they deserve.